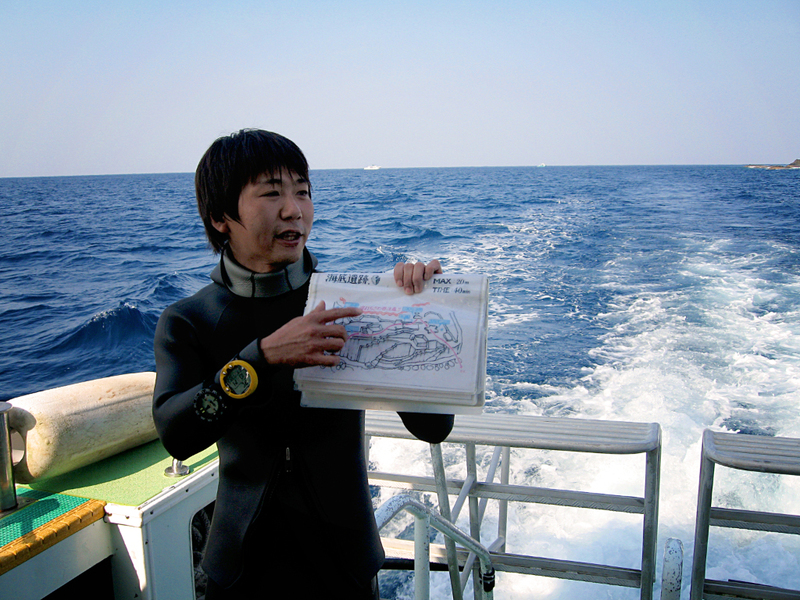 “Ooooooooh-Kay, let’s go diving!” our Japanese divemaster from Yonaguni Diving Service (YDS) says in his passable but heavily accented English. 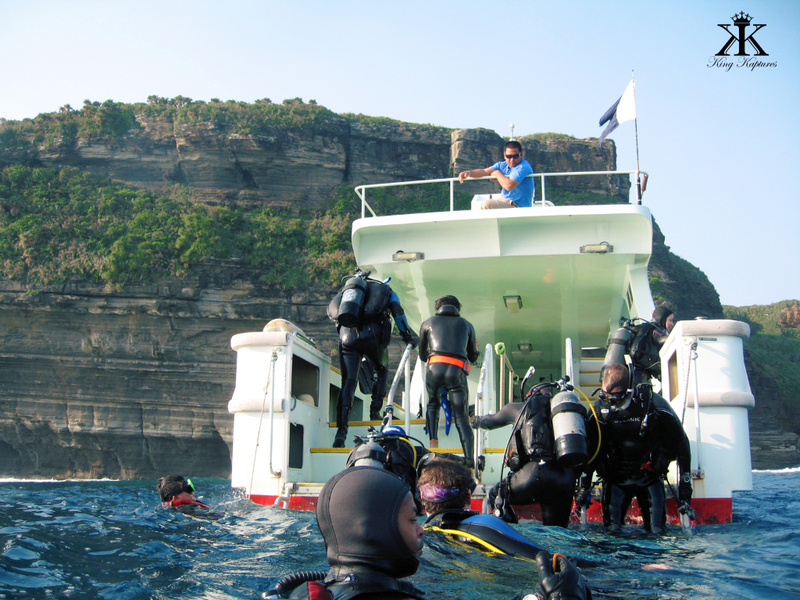 Cheers go up from the eleven of us congregated across the stern of the dive boat, all in great anticipation of this, our first dive not just in Yonaguni but on the famous (or infamous) Yonaguni Monument. Standing on the top rung of the boarding ladder, I can see the mysterious structure looming just there in deep, visible here and there as the waves play peek-a-boo with their shifting patches of blue-black darkness and bright blue refractions. “Ichi…,” he calls once cleared by the boat’s Captain, and continues, “…Ni…SAN! !” On “three” our our leader disappears backwards into the water. The rest of us are not far behind. The group descends immediately and conducts a rough rendezvous at about 60’, surrounded by giant stones which, at first and quick glance from afar, seemed to broadcast the tell-tale marks of the hand of man. Signaling all okay, our tour of the underwater “ruins” begins. 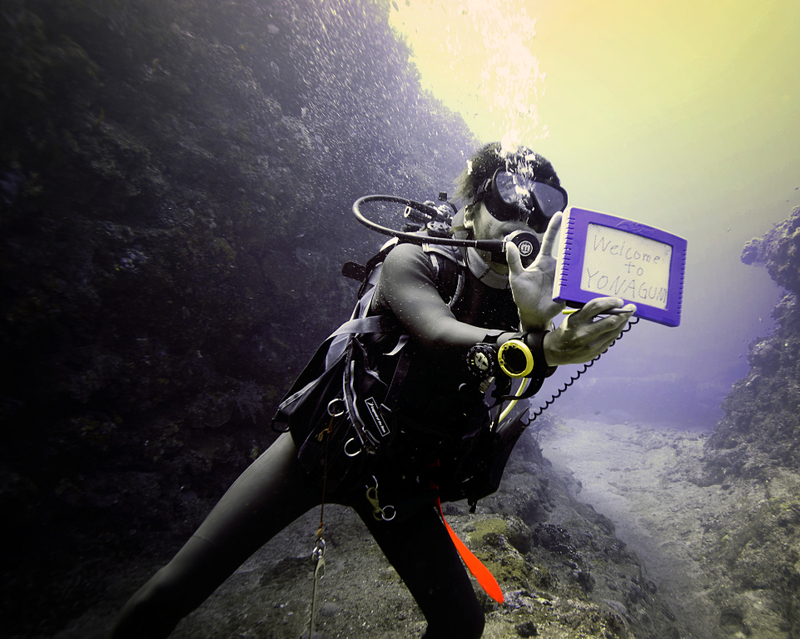 “This is Gate,” our divemaster has written on his underwater slate in good, clear English. He points to an opening in a rock face, at first hidden in the early morning shadows, but clearly there. 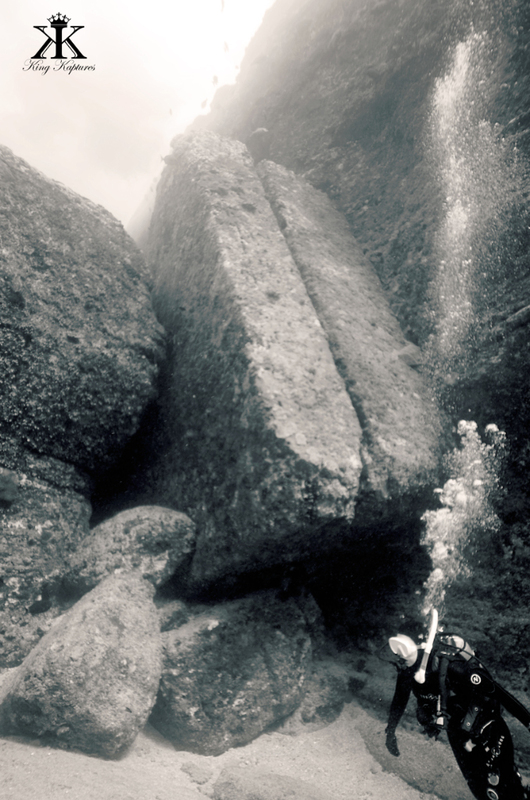 It is an oppressively small opening, just large enough for divers to swim through, and swim through we all do in a follow-the-leader way, making sure pictures are taken of our emergence into the Monument proper. “That wasn’t’ carved,” I think to myself, and note that it didn’t even appear to have been “constructed,” although many claim it to be an arched gateway entry into the complex. If so, the ancient residents there were taller than leprechauns. Emerging from the Gate, We have Arrived! Once “inside” the complex, we immediately are faced with the “Twin Towers,” sometimes called “columns.” They are not columns, but very large slabs of stone, roughly matched in size and orientation. They are indeed pretty good representations of rectangles, probably about 20 feet (or more) long, and they are more or less aligned with each other, with only a couple of inches of gap between. Images of Stonehenge dance in my mind, and for an instant, I could envision some astrological purpose for such design and placement given their odd resting angle. Or could it be that fractured rock just happen to fall and get wedged in this position?? 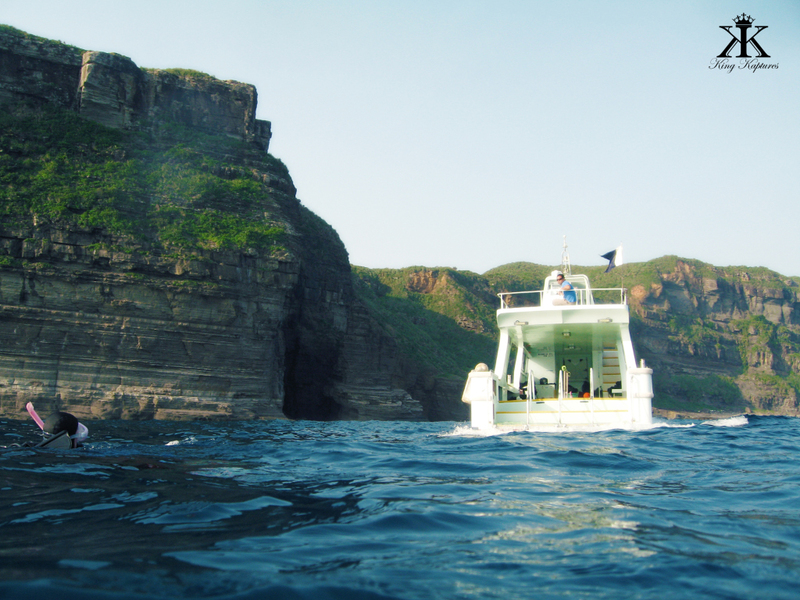 We round a corner and start to fight the famous Yonaguni current. The waves can be seen crashing against the stones on the surface just overhead. And turning the corner we come face to face with the Monument’s “terrace,” an awe-inspiring sight for anyone, believer or skeptic. Straight lines, sharp angles, and flat surfaces all too perfect to have been formed by Mother Nature alone are all right there, a feast for the eyes. 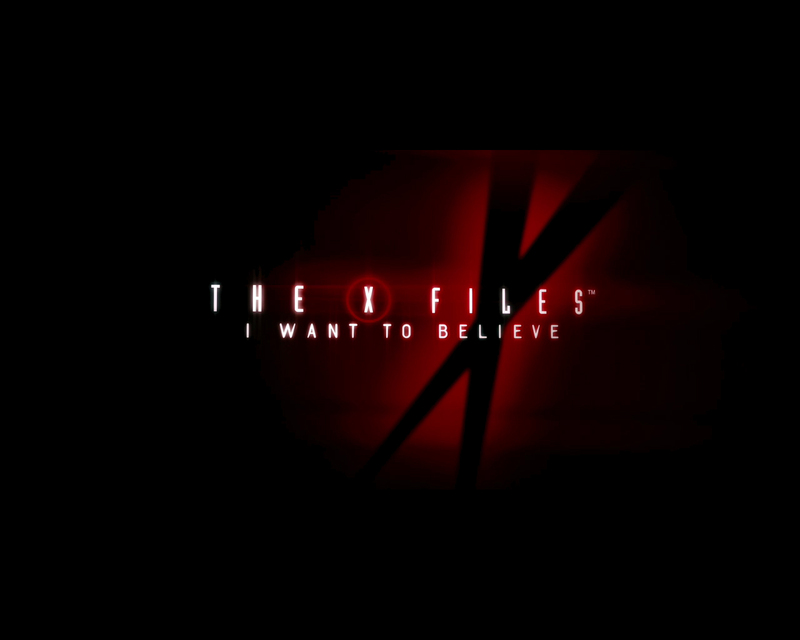 Yes, I do so want to believe. Thinking about similar ruins around the world, one wants to believe that there is an Asian counterpart to Maya temples or the ziggurats of Sumer, or even Atlantis! But there’s other magic here besides the possibility of undiscovered ancient civilizations. There are optical illusions, which are often the case in water. Water absorbs colors in natural sunlight very quickly; passing about 30 feet, most of the red, yellow and orange in sunlight is already gone. The dark blues, purples and greens remain, and do well to hide imperfections, much as wearing black does for the movie stars. Sure, from a distance stones seem to be clearly carved and overly ordered, but from up close, this often-taunted “perfection” blurs with the very edges and angles of the rock, themselves covered in fuzzy biological growth that helps complete the illusion from afar. The Only Turtle I Saw on the Monument…. We come to a shallow point of the ruins referred to as “The Turtle.” Loitering there as a group, I admire the stone formation, but have a very hard time seeing a turtle. 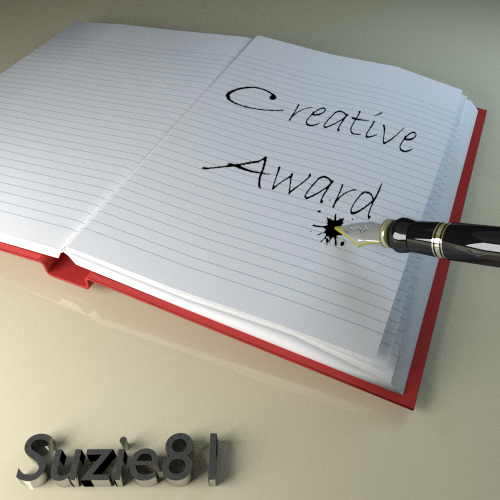 In the most abstract sense it is there, but then again…. 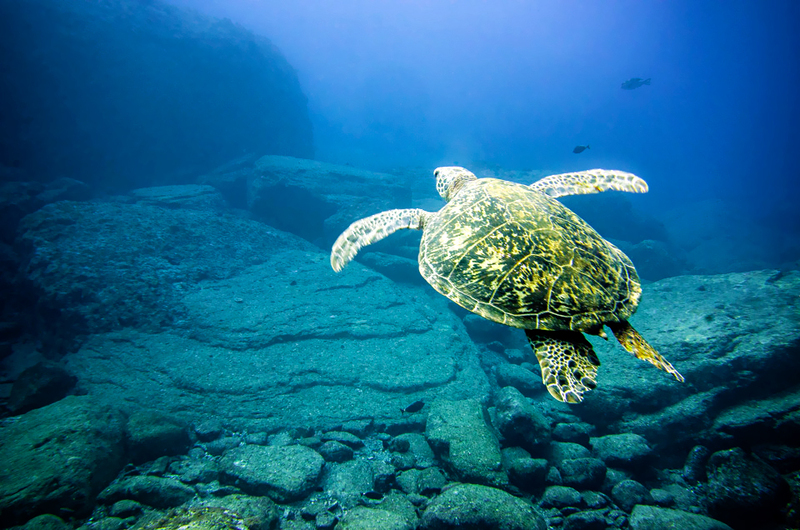 Turtles have a long and symbolic history in Okinawan history, with even the earth being carried on one’s back. But what appears from a distance to be a carving is really a stretch of anyone’s imagination. Initially the turtle’s head seems to be a finely carved symmetrical triangle with a sharp point, a rarity in nature. That triangular head is matched by another triangular notch in the stone terrace just below, evidence of uncanny alignment. 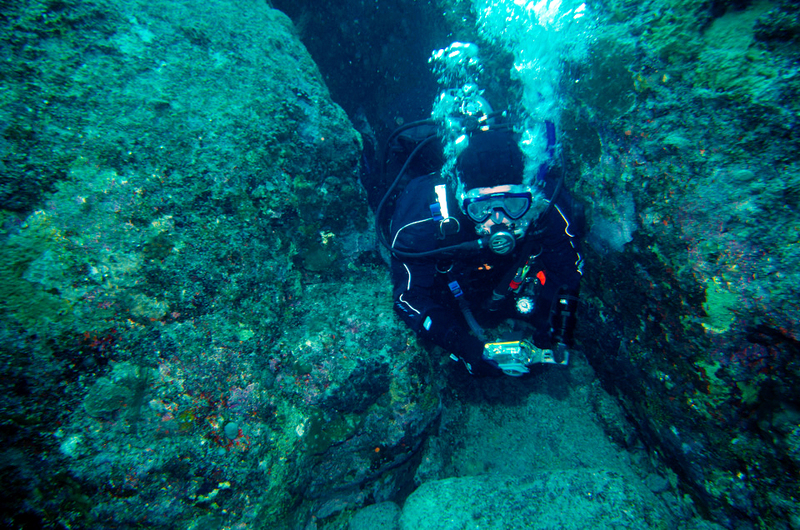 But again, King Neptune and Poseidon’s light show in the underwater world create illusions. The “triangle” is, in fact, pretty well deformed, particularly on one side. And those notches so well aligned? They are not: actually offset from one another, the only alignment comes from a shared fault line in the stone, clear to even the most casual observer upon closer more objective inspection. After 30 minutes our air supplies are running low. Fighting the wicked currents blowing across the stone (could the currents be responsible for grinding down the flat surfaces over time??) 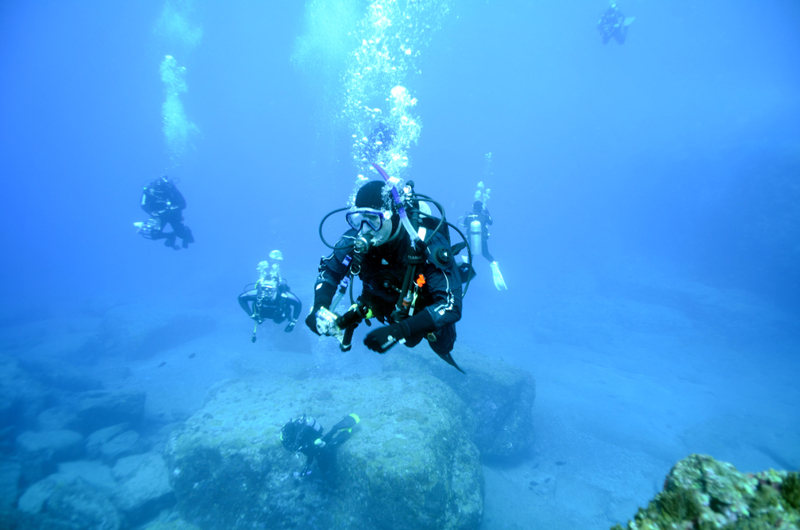 has taken its toll on the dive group, already lower on air than normal since we’re all using smaller scuba cylinders that are standard throughout Japan. We surface and our dive boat backs down on the group to pluck us out of the surging sea, crashing up against the rock just tens of meters away. Looking at the islands cliff face just above the monument’s location, I can’t help but see clear resemblance in the stone. 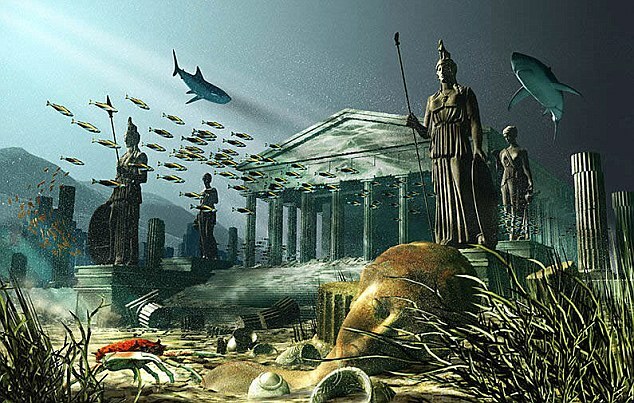 Or could it be that a manmade temple complex sank into the ocean in some ancient cataclysmic event lost to time? The Turtle Head’s sloppy geometry and clear fracture lines are clearly evident here…. Immediately in my mind the word “NATURAL” flashes bright red with a klaxon horn matching each illumination, must like a modern aircraft cockpit warns a pilot of fact over a fiction which he or she may want to believe. But I think for a few moments, trying not to say anything too extreme or absolute. Nothing good ever comes from such a position. 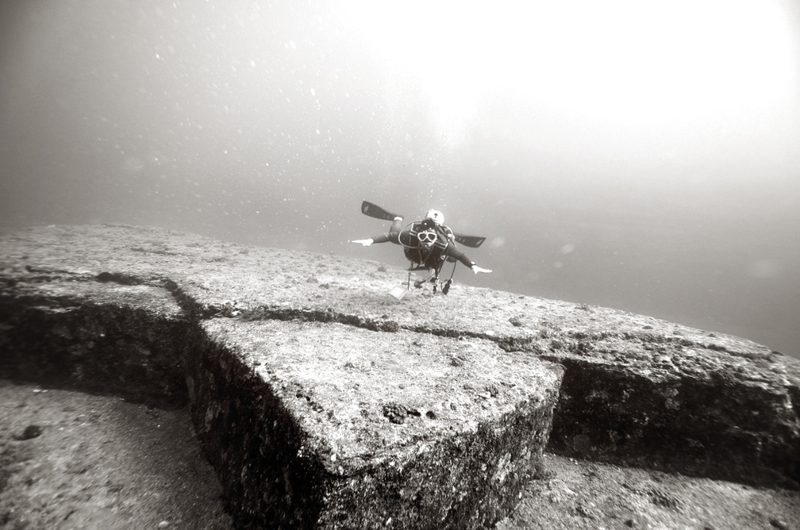 The Yonaguni Monument (与那国島海底地形 Yonaguni-jima Kaitei Chikei, “Yonaguni Island Submarine Topography”) is a massive underwater rock and stone structure off the coast of Yonaguni, the southernmost of the Ryukyu Islands of Japan. There remains a debate whether the site is completely natural, is a natural site that has been modified by human hands, or is wholly a man-made artifact. Since there are those who so badly want to believe, often the site is called in Japanese the “Yonaguni (Island) Submarine Ruins” (与那国（島）海底遺跡 Yonaguni(-jima) Kaitei Iseki) in a nod to those wishing for a more interesting explanation. 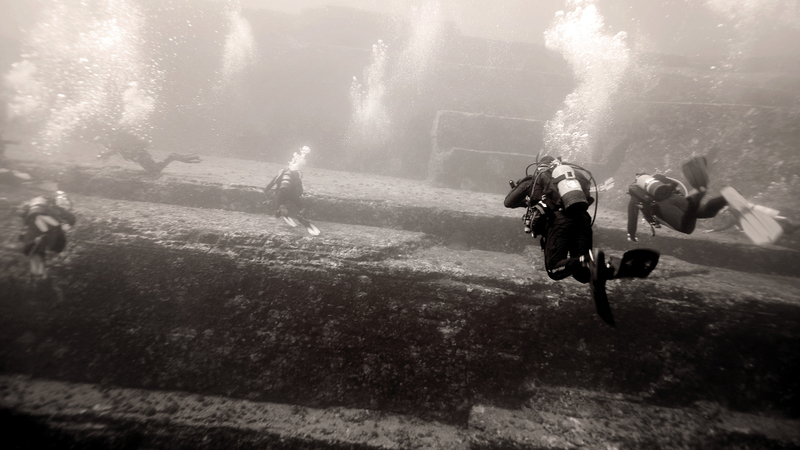 The Yonaguni Monument divides the masses of people who now visit there, much as it splits the massive ocean flowing by. There are believers and there are skeptics, and not a lot of in-betweens. I didn’t pole our particular tour group to the island; I didn’t want to try and take anyone’s faith away in an idea so grand. And besides, it’s almost impossible to debate people when their strongest evidence is rooted only in faith. Jody I think agrees (mostly) with me. 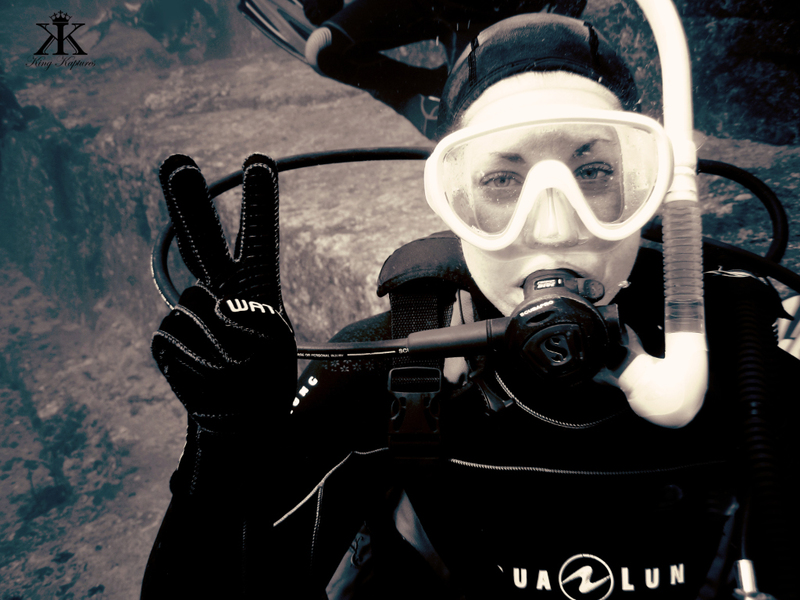 The site was “discovered” by dive tour operator Kihachiro Aratake in 1985 as he searched for new sites from which to dive with schooling hammerhead sharks (see A JAW-Some Valentines for our shark adventure at Yonaguni!). And the person most responsible for camp of believers in a 10,000 year-old lost civilization of the lost continent Mu is Masaaki Kimura, a marine geologist at the University of Ryukyus. Over the past 15 years, Kimura has come to the conclusion that this monument is most definitely manmade. According to Kimura, the largest structure at the site appears to be a complicated, monolithic, stepped pyramid that rises from a depth of 82 feet. While he claims the structure resembles a ziggurat, a type of vertically stepped structure found throughout Latin American and in the Middle East, such abstract dots are hard for most people to connect in their perhaps more discerning minds. Some pretty strong leaps of faith in these labels! 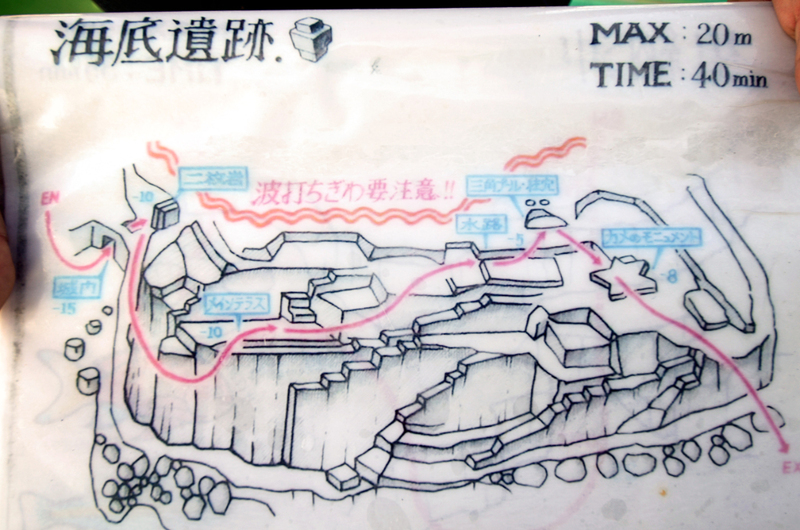 And of course there are claims of many additional structures nearby, including a castle, five temple-like structures, and what seems to be a huge stadium, said to be connected by roads and canals…. The cynic in me notes that at one time many if not most people believed the dark lines seen on Mars through early telescopes were clearly roads or canals of a lost yet advanced civilization who once thrived there. 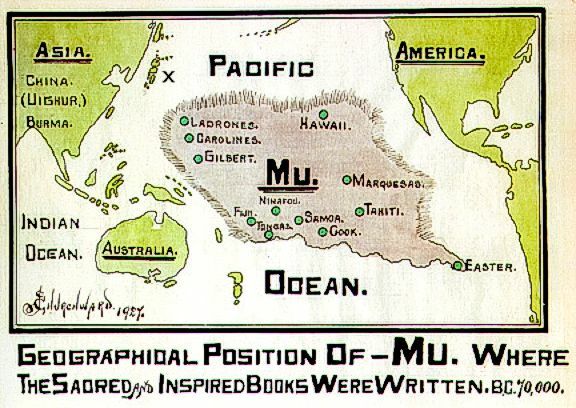 Mu is the name of an almost wholly made-up “lost” continent whose entire concept was proposed by 19th-century traveler and writer Augustus Le Plongeon. He claimed, based on scant evidence that cannot be reconfirmed or reproduced (think of the Mormon tablets), that several ancient civilizations, such as those of Egypt and Mesoamerica, were created by refugees from Mu—which he originally located in the Atlantic Ocean. 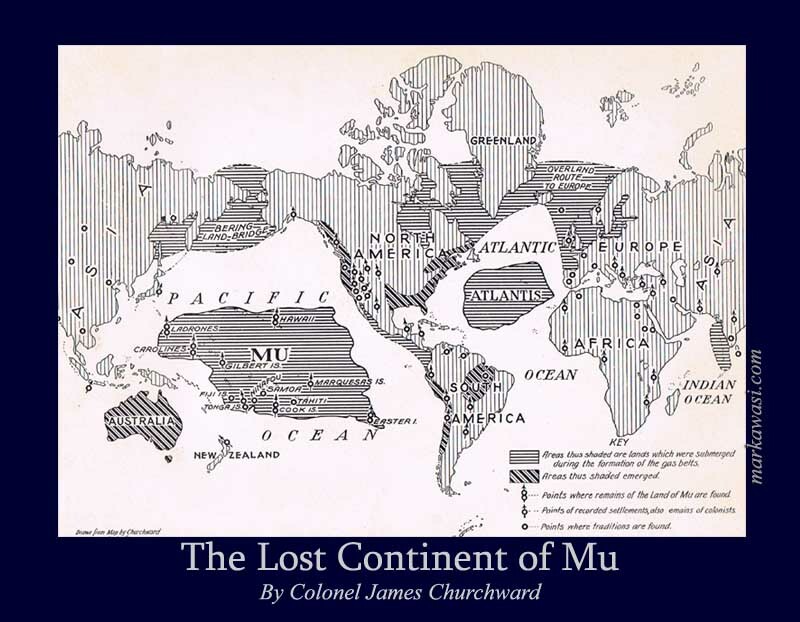 This concept was popularized in public opinion and expanded by James Churchward, who asserted that Mu was once located in the Pacific…without any real proof to back such claims. Not surprisingly, Mu in modern times is considered to be an entirely fictional place. Yet, people so badly want to believe…. 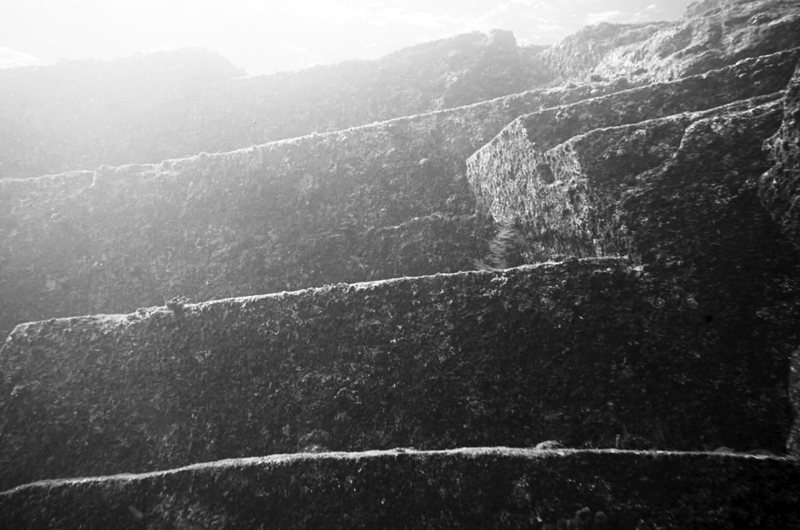 Growing up in South Florida in the 1980s, I remember a “discovery” not unlike that of the Yonaguni Monument. 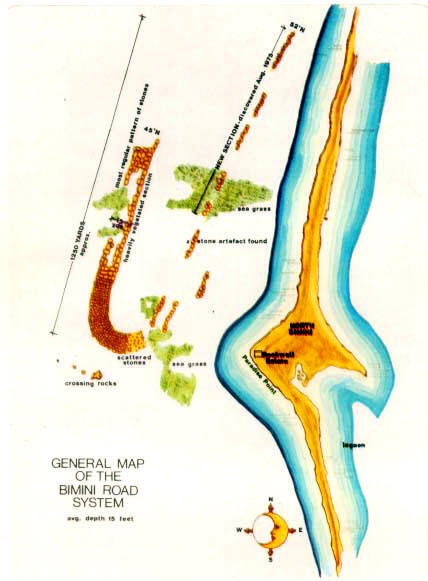 The “Bimini Road,” sometimes called the Bimini Wall, is an underwater rock formation near North Bimini Island, part of the Bahamas chain of islands. The “road” consists of a half-mile long northeast-southwest “linear feature” composed of roughly rectangular to “sub-rectangular” (remember the optical illusion discussion above?) limestone blocks. Various claims attest that this feature is a wall, road, pier, breakwater, or some other man-made structure. 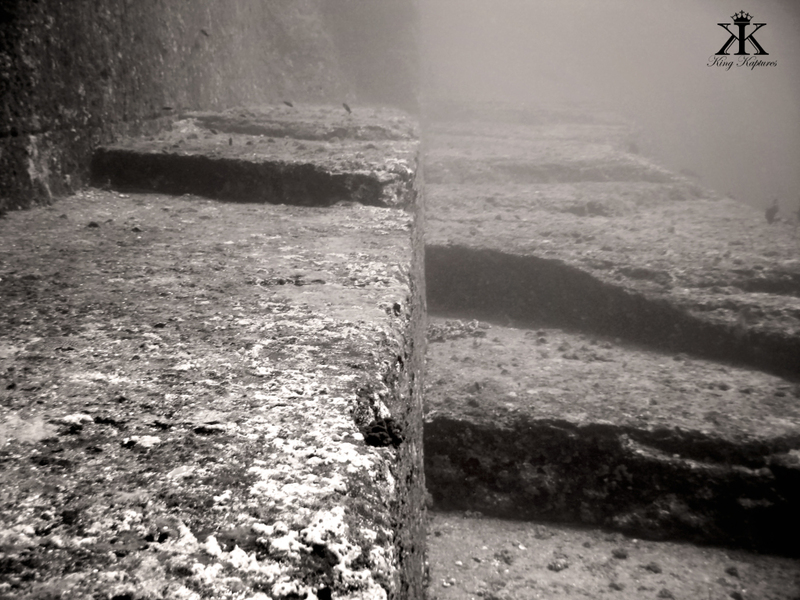 Even though there’ been extensive research and investigation into this “road,” credible evidence or arguments for a man-made, ancient origin connected to the lost civilization of Atlantis remain largely lacking. Yet people continue to believe. 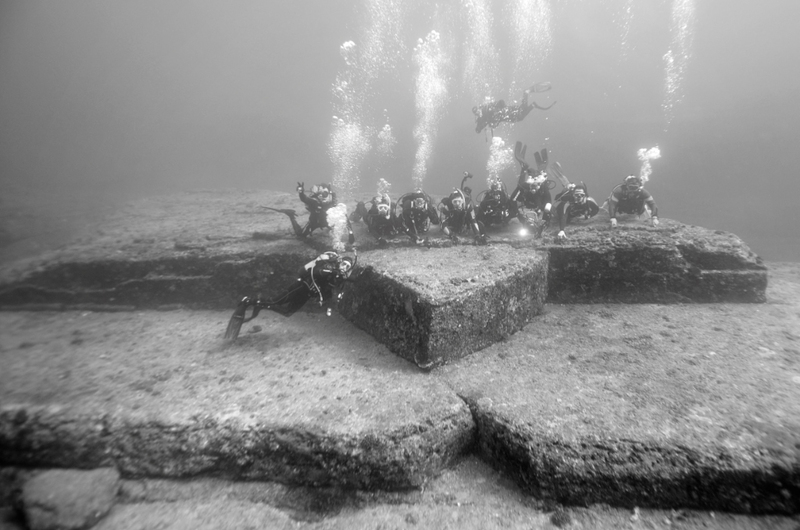 Kimura first estimated that the Yonaguni monument must be at least 10,000 years old, dating it to the 9th century, BCE, predating all the other massive buildings of ancient mankind. This assumed the site was created when it was last dry land during the last Ice Age, a date incongruous with our accepted modern understanding of the spread and development of ancient peoples. In 2007, partly to avoid this rather bothersome problem, he revised his age estimate to 2,000 to 3,000 years ago, more in line with the history of mankind in the region, but a time when sea level then was close to current levels as we experience now. To still allow for the idea of human involvement, he now suggests that after construction above the ocean, earthquakes and other associated tectonic activity submerged the structures to where we find them today. While most scientists, archeologists and anthropologists think all of this rather unlikely, Kimura, who so badly wants to believe, further claims beyond the multiple structures that he can identify, he himself now surmises that the site may be a remnant of the mythical lost continent of Mu, an idea already rooted in dubious origin as discussed above. I barely had a cell phone signal! 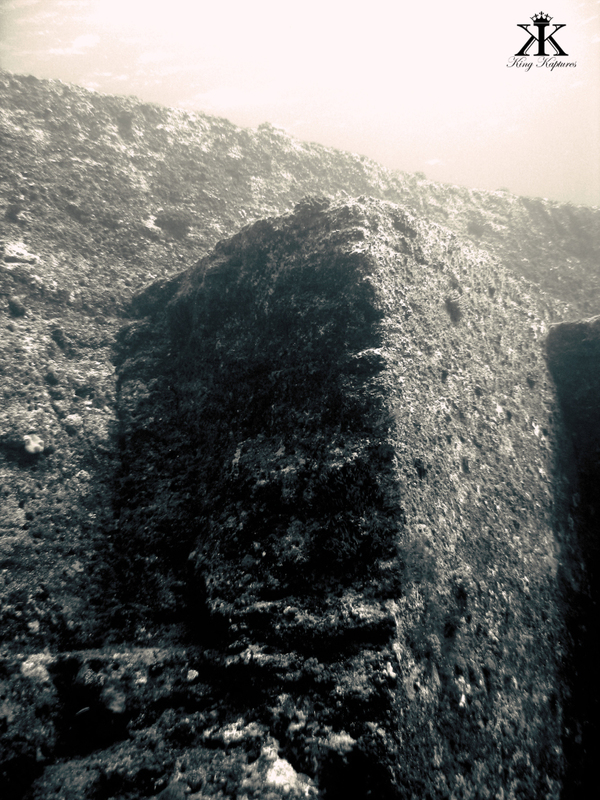 The existence of an ancient stone working tradition at Yonaguni and other Ryukyu islands is demonstrated by sold tombs and several stone vessels of uncertain age. 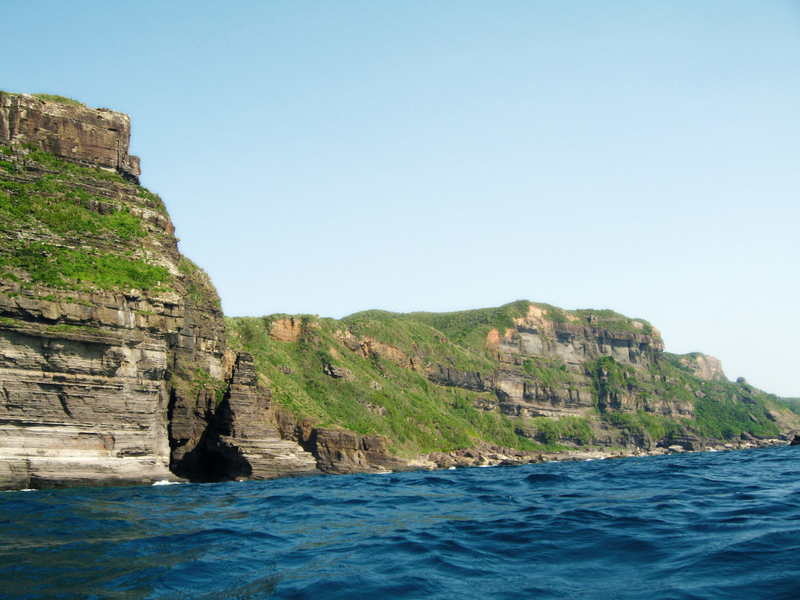 However, pottery, stone tools and large fireplaces found on Yonaguni are dated only as far back as 2500 BCE. Further, these communities were small and most likely found it very difficult to eke out an existence; such ancient settlements almost certainly lacked the resources, manpower and extra time and energy for building such massive stone monuments. It’s not unfair to say that Kimura has become obsessed with the Yonaguni Monument since first visiting. I’m convinced that at that over time he came to his own personal emotional conclusions, rather than using anything resembling the scientific method to investigate what are really extraordinary claims. 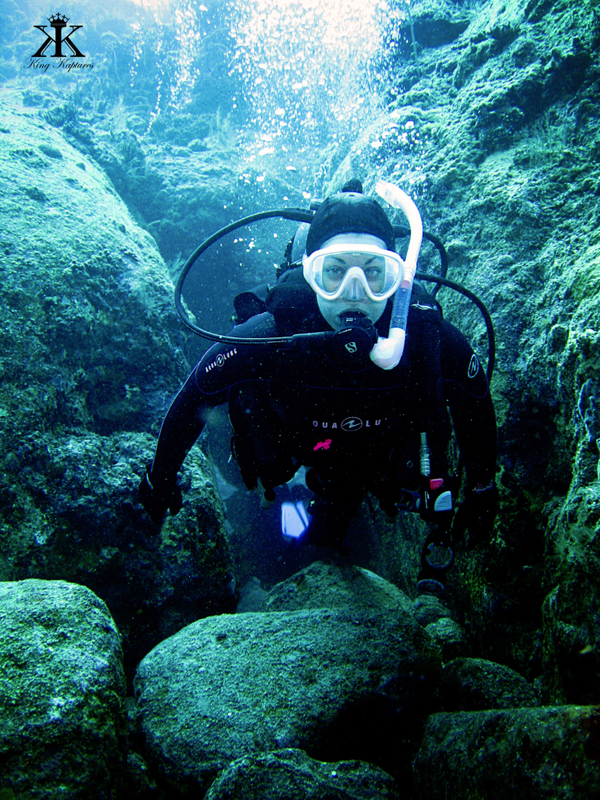 He founded the Marine Science and Cultural Heritage Research Association, an organization devoted to proving that the Yonaguni Monument is not merely the natural formation it appears to be to so many, but rather a manmade structure, consisting of a huge network of buildings, castles, monuments, a stadium, and other structures, all connected by an elaborate system of roads and waterways. This is exactly the kind of manmade mystery that people love! And the news and mass media of all types have run with the dubious story, trumpeting Kimura’s discovery with clichés like “Scholars mystified” (they really are not), “underwater city” (yet to be proven), and “Japanese Atlantis” (in a silly nod to the dubious idea of the lost continent of Mu). History’s Mysteries on the History Channel produced “Japan’s Mysterious Pyramids,” (I didn’t see any “pyramid” on my dives there) an episode which promoted the idea of a long-lost advanced civilization, but with almost no critique or balanced reporting. 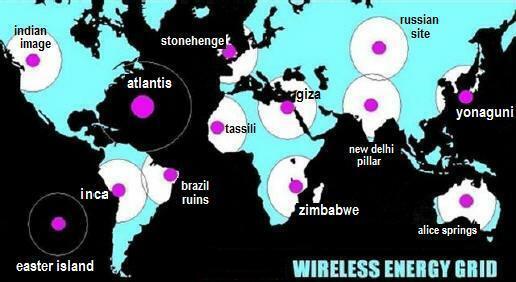 And worse, the show Ancient Discoveries aired an episode called “Lost Cities of the Deep,” featuring Yonaguni. 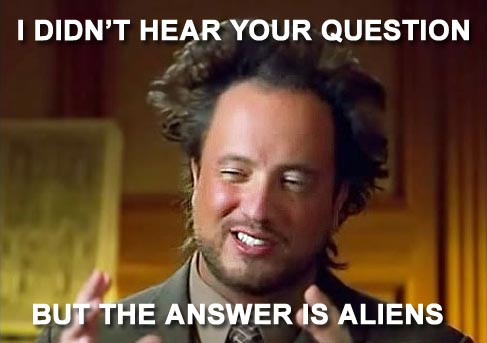 And both the BBC and the Discovery Channel have produced loose “documentaries” promoting a rather one-sided view of the Yonaguni Monument as having a mystifying manmade past. And if it’s on TV it must be right, RIGHT?!? What People Wanted to Believe about Mars…. 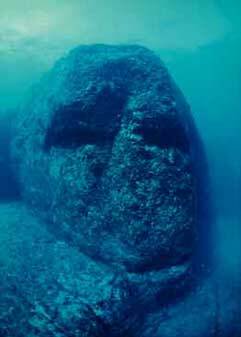 A case-in-point for me personally is the Yonaguni “Face.” Conspiracy theorists love to lock onto the idea of a face carved into the stone of the monument. The face, or “Jacques’ Eyes” as it is sometimes called (named after Jacques Mayol who used to freedive the site), appears on a large round-ish boulder, and consists of two depressions near where eyes might be, but it certainly in no way even remotely resembles a carved head. Examining photographs of the Jacques’ Eyes formation, I remain far from convinced the eyes were carved. They’re large concave depressions without distinct edges, not eye shaped, not symmetrical, misaligned, and not convex like an eyeball. Even an incompetent artist would have done a far better job if eyes were the goal! Even Kimura doesn’t go so far to presume it is a human head or face, even though he does claim that the “eyes” were indeed carved by hand. This whole idea is just way too reminiscent of the “Face on Mars,” which of course turned out to be simply Venus and Zeus playing with celestial light against natural formations. But people so want to believe, right? The “Face” of Jacques’ “Eyes”! 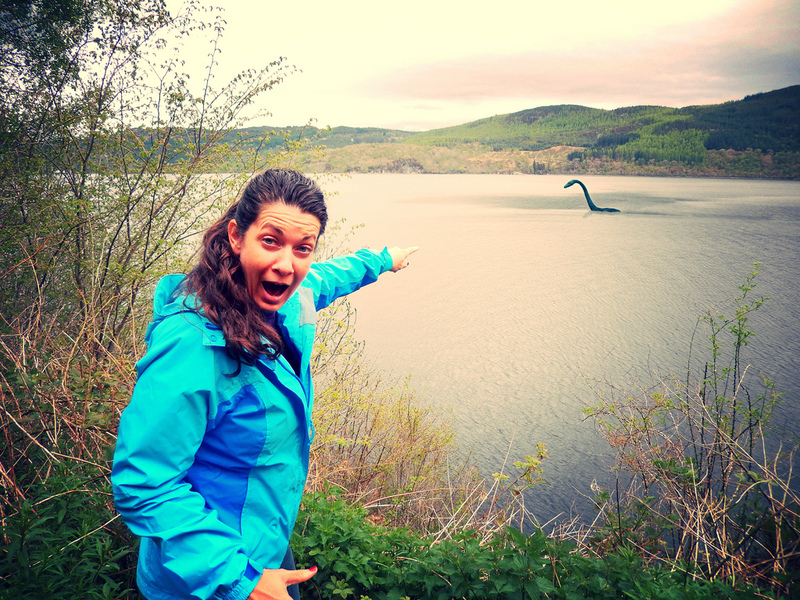 We did manage to find Nessie! Yes, even for me, a believer in science and (naughty) skeptic by nature, I too at times want to believe. I’m addicted to “Finding Sasquatch,” used to search the skies for UFOs while flying and at sea during my time in the Navy, and I actively taunt ghosts wherever they are claimed to lurk in the hopes of having a personal paranormal experience. But alas, to date, nothing out of the ordinary has really happened to me, other than an exciting life well-lived! 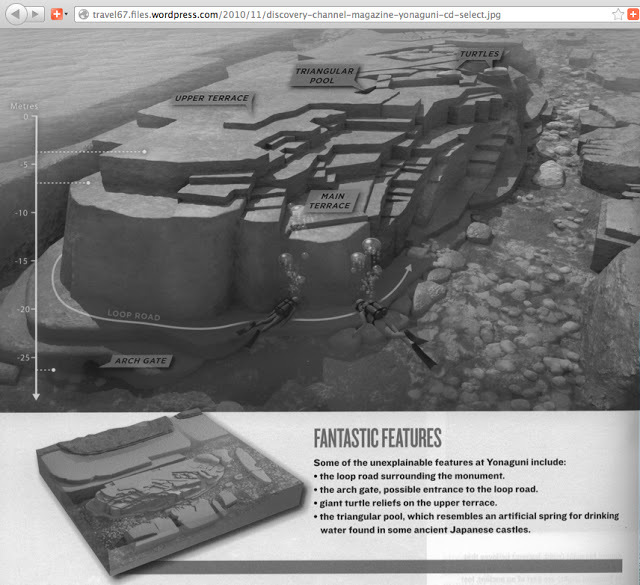 Unfortunately, my beliefs don’t extend to the Yonaguni Monument. And it appears I’m not the only skeptic when it comes to Dr. Kimura’s bedrock interpretation. 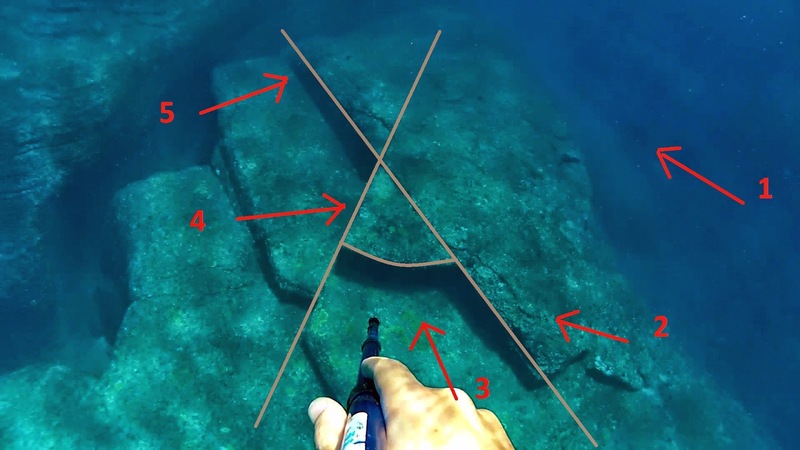 Virtually every marine geologists who have seen the pictures are perfectly satisfied that the formations as-is are fully consistent with those that occur naturally, both on and around Yonaguni, in addition to other parts of the world. 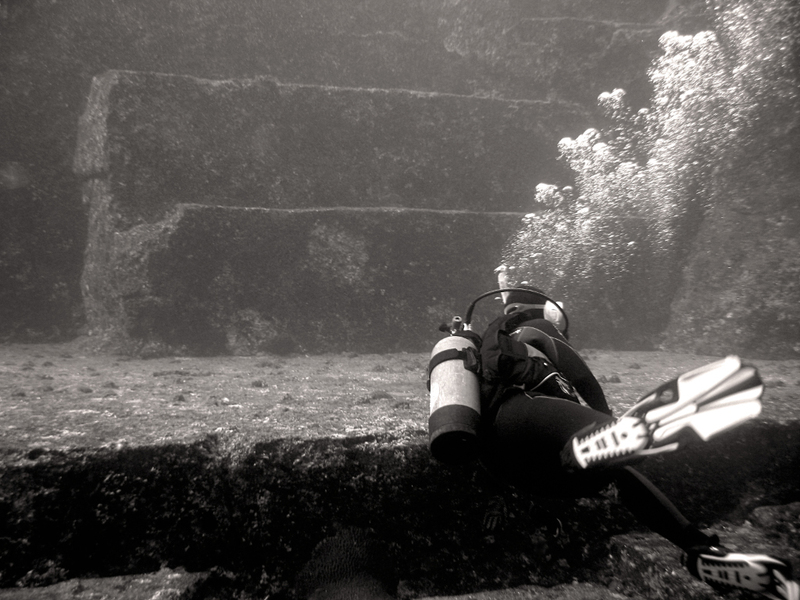 Yes, the site is impressive and unusually dramatic, and yes, there are features that make divers do a double-take, but seriously, I quickly came to the conclusion that what we were diving on, over and through was not the work of man, but the hand of god…meaning Mother Nature at her artistic finest. The only thing that made me stop and really consider the possible manmade origins of the monument was initially the triangle of the “Turtle,” but even those hopes were dashed as described above. At the end of the day, here will be those who believe the Monument is natural, until a “smoking-gun” can be provided as evidence to the otherwise. And there will be true believers, whose faith remains strong, even in the face of mounting evidence contrary to their belief. 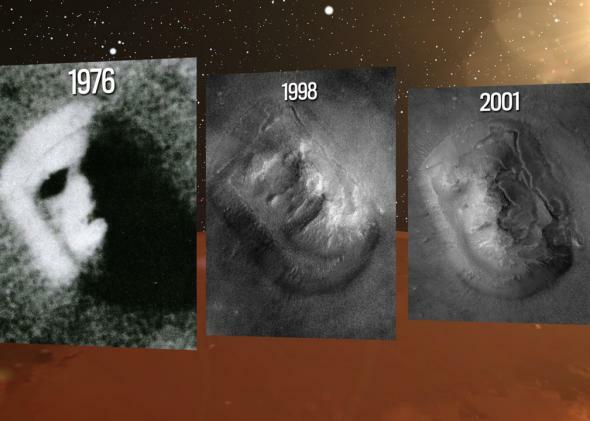 Sasquatch, the Shroud of Turin, the recent supposed photos of naked aliens running around Mars…. They all point to the same thing: that part of the human condition is wanting so badly that there is more to life that what there just appears to be. Me – all the cosmic mystery I need as I sit here and work on the final draft of this blog is the purring love of my cat Cleo. There is no greater proof of the power of life than the tangible bonds we share as part of nature. 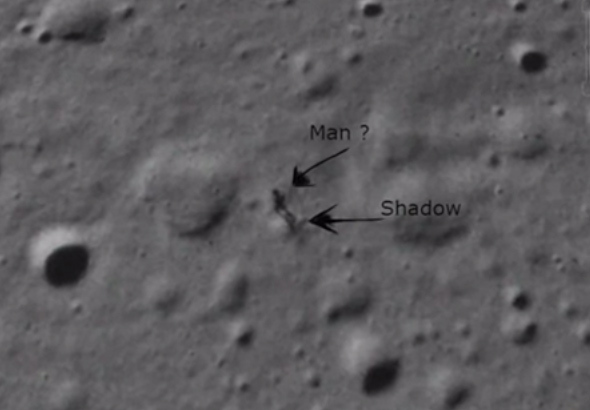 A Supposed Photo of an Alien Walking on the Moon; Do You Believe? 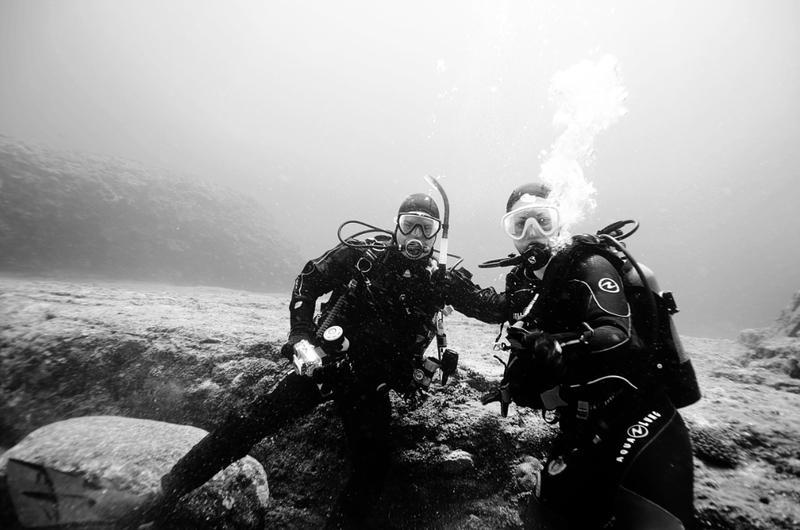 We make it back to dive the Monument one more time. The steep forbidding gothic cliffs above, the eight story tall stone giant below. Again there is awe at the world’s amazing wonders, and yes, even creeping doubt. 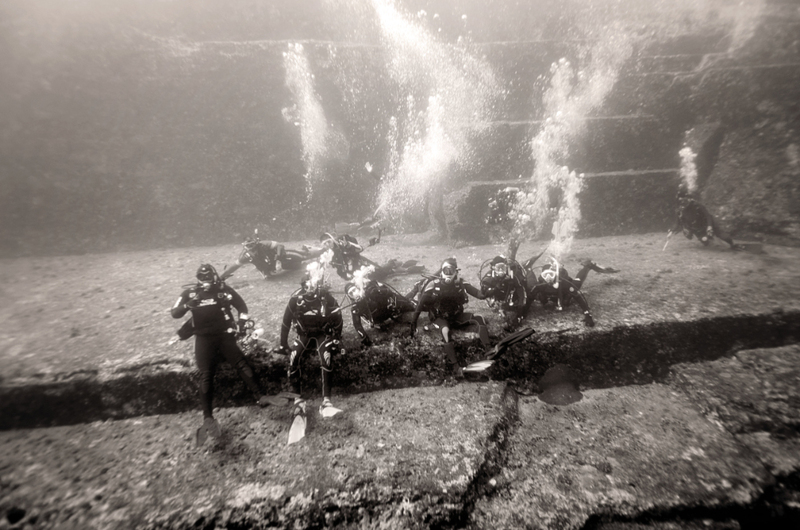 But I have to conclude, sadly, that Yonaguni, while a terrific rural example of old-tyme and laid-back Ryukyu life which happens to offer amazing sites for scuba divers, just isn’t the seat of an ancient advanced civilization or the Lost Continent of Mu…. Chang, K. “The Formosa Strait in the Neolithic Period.” Kaogu. 1 Jun. 1989, Number 6: 541-550, 569. Hudson, M., Takamiya, H. “Dental pathology and subsistence change in late prehistoric Okinawa.” Bulletin of the Indo-Pacific Prehistory Association. 1 Jan. 2001, Volume 21: 68-76. Jiao, T. Lost Maritime Cultures: China and the Pacific. Honolulu: Bishop Museum Press, 2007. 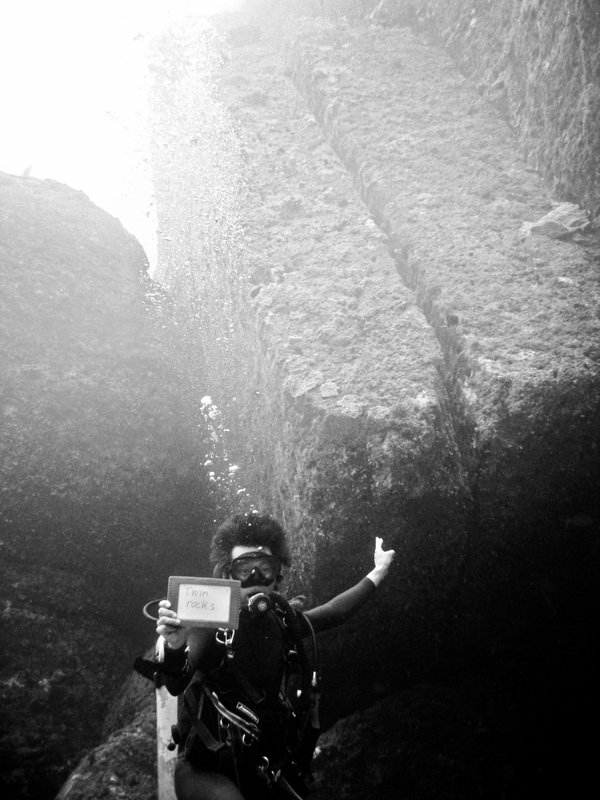 Kimura, M. “Yonaguni.” Marine Science and Cultural Heritage Research Association. Dr. Masaaki Kimura, 24 Oct. 2007. Web. 20 Aug. 2010. Milne, G., Long, A., Bassett, S. “Modelling Holocene relative sea-level observations from the Caribbean and South America.” Quaternary Science Reviews. 1 Jan. 2005, Volume 24, Numbers 10-11: 1183-1202. 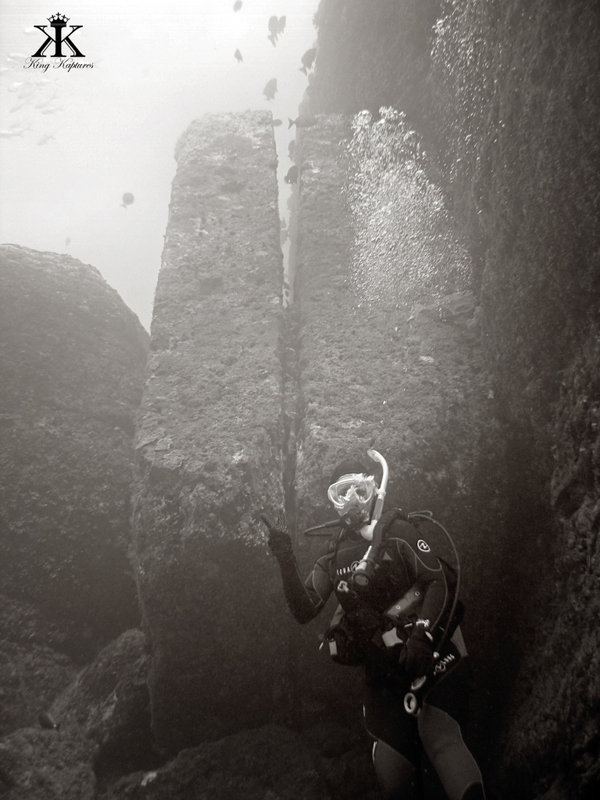 Schoch, R. “An Enigmatic Ancient Underwater Structure off the Coast of Yonaguni Island, Japan.” Circular Times. Dr. Colette M. Dowell, 19 Apr. 2006. Web. 20 Aug. 2010.